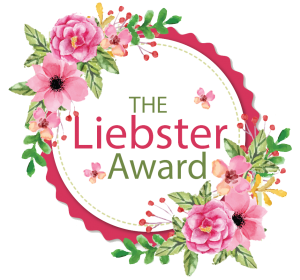 I just got back from a wonderful family trip to Disney World (my happy place) and will be sharing my experiences in a multi-part series of blogs. 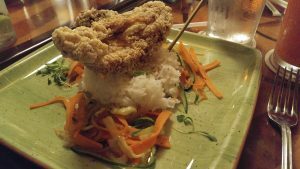 Today I’ll be sharing with you a review of Disney World’s restaurant, the Jungle Navigation Co. LTD Skipper Canteen, located in Adventureland, in Magic Kingdom. The Skipper Canteen is a restaurant based on the famous Disney ride the Jungle Cruise. The backstory is that in order to generate more income, the owner of the Jungle Cruise has decided to convert their main offices into a restaurant and to have the Jungle Cruise skippers act as waiters and waitresses. The restaurant is comprised of 3 rooms, the crew’s mess hall, the Jungle Room (formally the family parlor) and the S.E.A. Room (a secret meeting place for the Society of Explorers and Adventurers). Along with service from the skippers comes their sense of humor and I have to say, the service was excellent. Those of you who know me well know how much I love WDW and how easy it is to get safe gluten free food there. In this case, the Skipper Canteen did not disappoint me. Dinner at the restaurant is worth 1 table credit on the dining plan and serves lunch and dinner. After waiting for approximately 10 minutes (not bad for a WDW restaurant), we were seated in the S.E.A. Room. After walking around the crowded park all day, it was wonderfully peaceful and relaxing. I went with a group of 7 other gluten free diners. 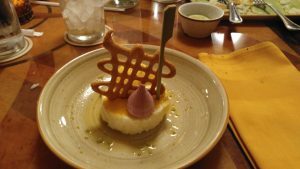 A few of them had other food issues, so we were able to really explore the Skipper Canteen’s allergy menu. 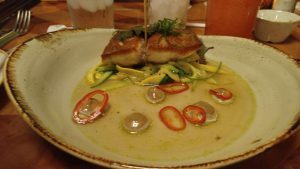 At first, I was nervous about the idea of eating at a restaurant that specialized in a mix of Asian, South American and African food. Since my family likes mostly simple and plain food, this sounded a little too exotic for their tastes, but since we had never eaten there before, the family was very excited to try it, so we went for it! We were given the allergen menu when we sat down. We were also lucky to have the chef come out to speak with us (mostly because of the other allergens in the group). First, we ordered the soup or salad. 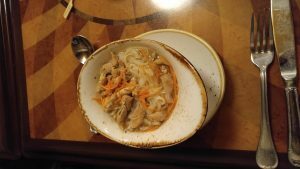 The soup was a gluten free chicken and rice noodle soup that everyone thought was tasty. Some of us also ordered the Jungle Green Salad. I’m not really a fan of iceberg lettuce, but it also include peppers, cucumbers, hearts of palm, radishes and pistachios covered in an aji pepper yogurt dressing. While the salad was ok, I would have rather had a base of romaine lettuce instead of iceberg. Most of us decided to go with Dr. Falls’ Signature Grilled Steak. 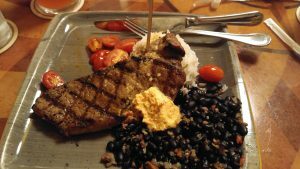 This dish included a medium cooked New York strip steak topped with Pico de Gallo butter (left out for the dairy free people), jasmine rice and braised black beans with Applewood smoked bacon, all topped with roasted tomatoes. It was delicious! The steak was cooked perfectly and I was surprised at how well all of the spices blended together without being overpowering. Another popular gluten free dish was the “Taste Likes Chicken,” because it is! fried chicken on a bed of jasmine rice and vegetables. It tasted so much like regular fried chicken, I was impressed. The coating was as crispy as you would expect and everyone who ordered it was happy they did. My sister-in-law had the sustainable fish, which was a white fish on a bed of vegetables, including zucchini, mushrooms and peppers. For dessert, most of us had the Quicksand, a jasmine rice pudding with mango sauce, lemon curd, hibiscus meringue and pineapple. Although my mother in law really liked it, I felt it was a little too heavy on the lemon flavor. We also tried the Monkey bites which was a gluten free dessert option on the kids menu. 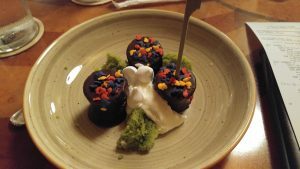 This included chocolate covered banana slices surrounded by candied chocolate sunflower seeds, pistachio cake and fresh whipped cream. This was very light and refreshing. I actually had to ask our server if the pistachio cake was really gluten free because it tasted so heavenly. Overall, I would gladly recommend the Skipper Canteen to anyone who has to follow a gluten free diet. 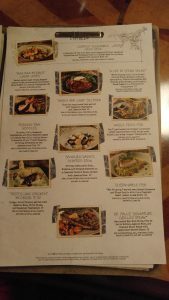 Stay tuned for part 2 of my Disney trip….a review of Raglan Road Irish Pub and Restaurant.